Overseas funds or International Mutual Funds are funds that invest in global companies for earning higher returns. These types of funds are also known as a foreign fund. International funds are becoming one of the popular investment options for high-risk investors. International mutual funds offer risk reduction via diversification. It also provides you an opportunity to earn better returns via means of investing in the global market. There are many fund houses in India that offer international mutual funds with a different sector and risk class. In this post, I will cover everything you need to know about International mutual funds. What is International Mutual Funds? An International Mutual Funds are funds that invest in companies located anywhere outside of its investors country of residence. The returns from this fund depend upon the performance of the market they are investing and forex currency movement. If you have surplus money after doing investment for your financial goals, you can plan to invest in international funds. Some of the distinguished features of an international fund are given below. Better Prospects – International fund offers better prospects. These funds invest in global companies. Global companies are good in terms of resources, facilities, standards and government cooperation. You can take advantage from some of the fastest-growing market in the world. Currency Factor – These funds are highly depended on fluctuations in international currencies. Any major change in the currency rate adversely impacts the performance of a fund. Risk factor – Risk factors associated with the international fund is very high. A various risk associated with this fund are country-specific policies, geopolitical risk, market conditions, global economic conditions etc. Diversification – The prime objective of this fund is to diversify the investment portfolio of an individual. Most such funds invest in different securities in different countries, aiming to have a wide array of investment instruments at their disposal. Require Constant Monitoring – Investment in this fund is prone to multiple risks. This fund requires constant monitoring. Returns – The return offered by this fund is likely to be high. It varies according to multiple parameters. Also Read – How to Invest in USA Stock Market from India? 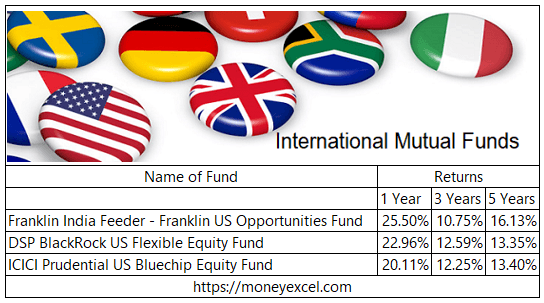 The first international mutual fund is Franklin India Feeder – Franklin US Opportunities Fund. This fund gives an opportunity to Indian investor for investing in US companies. It is a pure equity fund. Historical performance of this fund is very good. In last one year, this fund has generated 25.5% returns (As of July 2018). The expense ratio of this fund is low. This fund is suitable for investors with high-risk appetite. The second fund is DSP BlackRock US Flexible Equity Fund. This fund is managed by an experienced fund manager. The past performance history of this fund is very good. In last one year, this fund has given 22.67% return (As of July 2018). As per current asset allocation ratio, 95% of the money is invested in equity and remaining in debt. This fund is recommended for long term. ICICI Prudential US Bluechip Equity Fund is one of the best international funds. This fund invests primarily in US Bluechip stocks such as Amazon, Alphabet (Google) etc. This fund has given consistent performance. If you have surplus money and high risk-taking capacity, you can invest in this fund for 5-year horizon. There are four types of international funds. Details of each type is given below. Global Fund is one type of International Fund. Global Funds sounds like International fund. However, both are different. Global fund invests globally including home country. On the other hand, international fund invests only outside home country. If fund invest outside home country at specific geographic region, then it is known as regional funds. Investment in regional fund is risky affair. The fund which predominantly invest in specific country (Single country) is known as country fund. All three funds mentioned above are country specific fund. A fund which invest in specific sector globally is known as global sector fund. If you are interested in specific sector you can invest in global sector fund. These types of fund are also known as theme based funds. Who should invest in International Funds? International funds are suitable for the investors with following characteristics. If you have surplus money after investing for the financial goal. You are willing to invest surplus money for long term. Your risk-taking capacity is very high. You are not passive investor and cautious about tracking your investments. Those who wants to grab opportunity of investing in global market to earn better returns. If you carry above characteristic and willing to take joyride of investing in International funds, consider following important points. Understand the investment objective of the fund and associated risks. Check the track record of the fund. Look for experience fund manager. Make sure that the scheme you choose complements your current portfolio. Read the fund facts carefully for the underlying cost and expenses. Check if the country you choose has a tax treaty with India to avoid double taxation. Do extensive research, if required take help from experts. I hope information given above for the International Mutual Funds helps you in identifying best fund for investment. Do share your comment in the following section, because your comments are the fuel for me to write better in the future.